This past Tuesday, November 7, I woke up at 3.30 AM to catch an early flight to LA so I could get back in time to attend Joni Mitchell’s birthday party. Flight. Car. Hair. Make up. Fancy dress. Party. I had no time to think. No time to reflect. November 7th was also my mom’s 76th birthday, but she wouldn’t know that. She has advanced stage Alzheimer’s. 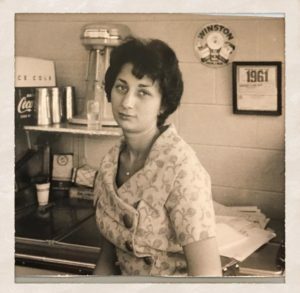 This morning KEXP broadcast their annual “Mom Show,” a remembrance of Morning Show DJ John Richard’s mother, who passed away from cancer. Music heals. It also opens wounds that sometimes need venting, and so, just a few songs into the “Mom Show,” all the emotions I didn’t have time to feel on Tuesday flooded in. In 2007, my mom—who had never lived anywhere but Northwest Indiana and had never lived by herself—traveled to Southern California to house sit for me while I took on a 6 month job in London. It was in that time and the months that followed, that I watched my mom seize her independence and with it came a confidence and happiness that had eluded her, maybe her entire life. In those six months, her creativity exploded as she scoured second hand stores for furniture to refinish and redecorate my house. She cooked vats of soup to take to her new friends in Palm Springs. She made cheesecakes for our hotel owner friends. She said she never had this much freedom to come and go as she pleased, to decorate the house however she wanted, to make dinner when she was hungry, not when everyone else was. I think I’ve built a life for myself that my mom always wanted. I live fiercely independently. Sometimes that independence can be lonely, but mostly it’s invigorating. I saw that spark in my mom. It was beautiful. This week as I take steps to make some big changes, I would have talked to my mom. She would have told me that she was so proud. She would have said that I am making the right decisions and if those decisions take a turn for the worse at some point, she’d be there to remind me that I have the power. I am in control. Independence inspires confidence and that is something you can’t get in a bottle. Find it in yourself by any means necessary. You’ll glow without illuminating face cream.